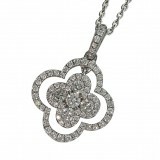 Beautiful Diamond pendant in a 4 leaf Clover design contains 0.55Cts of diamond total, including .. 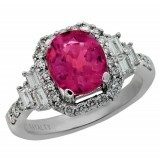 This is a very uniquely designed diamond right hand ring with a oval cut pink rubbelite in the ce.. 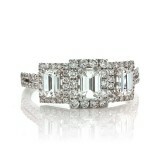 The eye-catching single row pave setting of this engagement ring sets it apart from similar but l.. 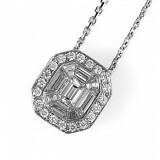 These gorgeous drop earrings are Oscar Worthy! showcasing 2 Large pear shaped Green Emeralds at a.. 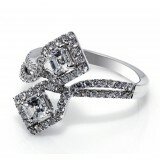 This rich pave set diamond cocktail ring is a masterpiece on her finger in 18k white g..
Ladies dangle diamond earrings featuring 2.75cttw round diamonds. 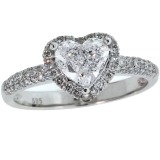 The diamonds are GH color and S..
Gorgeous Diamond encrusted setting, that is simple and elegant with just under 1/2 carat in diamo.. 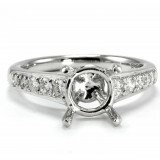 This ring is an absolutely gorgeous ring that will not miss anyone's eye. Th.. 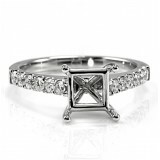 Beautifully designed engagement ring set with VS-SI quality and G-H Color with round and emerald ..
Delicate and beautiful, this diamond engagement ring in 18k white gold features a halo of sparkli..